Temporary closure of a section of the M10 between Piet Human and Robert Burns road for construction. 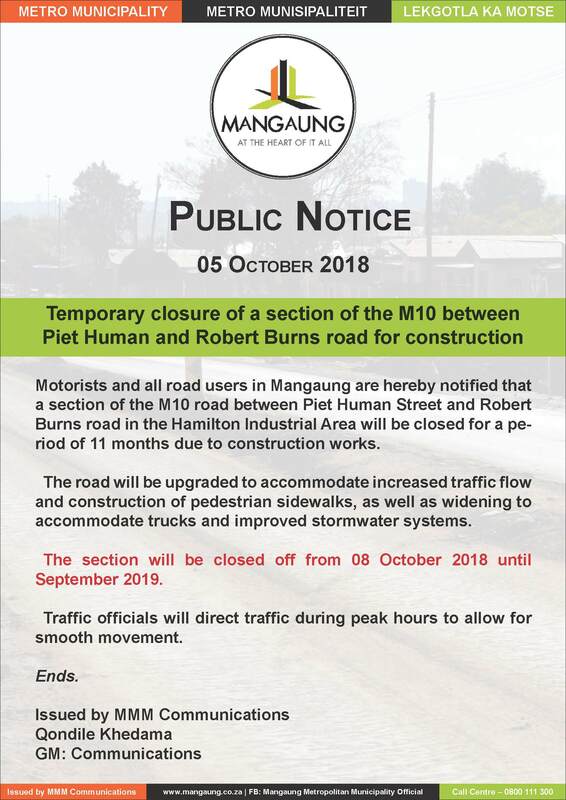 Motorists and all road users in Mangaung are hereby notified that a section of the M10 road between Piet Human Street and Robert Burns road in the Hamilton Industrial Area will be closed for a period of 11 months due to construction works. The road will be upgraded to accommodate increased traffic flow and construction of pedestrian sidewalks, as well as widening to accommodate trucks and improved stormwater systems. The section will be closed off from 08 October 2018 until September 2019. Traffic officials will direct traffic during peak hours to allow for smooth movement.